In addition to Pullijärve Holiday Village, we also offer accommodation in the nearby Bumblebee Forest Cabin (two kilometres from the Riga-Pihkva highway in the village of Kimalasõ, Rõuge municipality). The cabin offers a wonderful opportunity for a private, peaceful forest vacation on the shore of magical Lake Hino. The two floors of the cabin accommodate up to six people, but most importantly there is no electricity. This offers an extraordinary opportunity for guests accustomed to life in the city to spend a romantic evening by the fire or in candlelight without any interruptions. Close by there are spaces for tents, a kitchen and barbecue area, a hot tub, a sauna and a campfire site. In addition, it is possible to hire boats, paddle boats, aqua bikes and canoes. 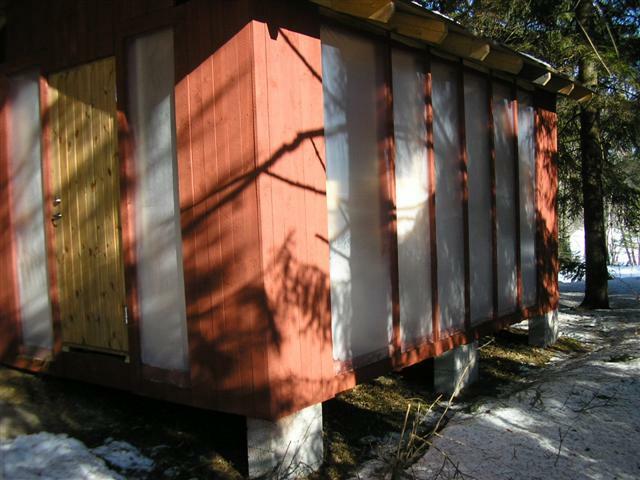 The cabin can be heated and therefore used in any season. There are hiking trails nearby, the forest offers a variety of mushrooms and berries depending on the season, and the terrace provides beautiful views over the biggest lake in Haanjamaa, its seven islands hosting the rare arctic loon among many others. The price of the cabin includes bed linen, towels and cutlery and crockery.